With wedding plans being made for beach-themed and beach weddings I thought it would be a good time to revisit beach wedding centerpieces. I will try and update prior suggestions I have given you and add some new ideas to help you even more. When planning a beach wedding or beach-themed wedding it allows you to bring the always appealing ocean and sand into the romance of your wedding day. Your colors might be the seaside and ocean colors or may be contrasting bright, fresh colors that complement the beach theme. Here are 10 of my favorite centerpieces that are bound to please you and your guests as you celebrate that most wonderful day. 1. 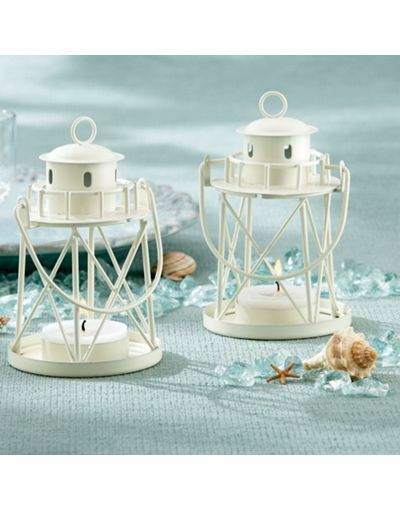 There are lighthouse tea lights available to purchase and arrange them on your tables placing small starfish or pretty shells around them. This is particularly lovely for a late afternoon or evening wedding reception. 2. Make a mini beach scene and pour sand into a wide-mouthed glass bowl or vase. Arrange into the sand beach related figures such as small pieces of driftwood, small shells, little wooden painted fish and such. 3. If you want flowers how about floating baby orchids or other flowers in a shallow clear glass bowls. You might put a drop or two of blue food coloring in the water. Just detach the flower from its stem and float it on top of the water. 4. Buy 6 inch in diameter bubble vases and pour purchased white sand into them. You can find bags of small shells on the internet or a craft store and buy as many bags as you will want based on the number of centerpieces you will need. Scatter a handful of shells evenly over the sand. Finally place pillar candles in white or a color of your choice in the center of the vase for lighting. 5. Metal lanterns in a blue or green shade and a tea candle or a battery-operated tea light placed inside is so romantic and get some dried sand dollars, small river rocks or bits of coral. Place all of this in a pretty arrangement on clean white sand to complete the beach look. 6. Gather a variety of shells and coral and place them attractively in a basket, beach pail, small beach bag or glass bowl and set on a small mound of white sand, or a bed of sea grass for a beachy centerpiece. 7. Arrange in the center of each table a lovely flower lei and place within the lei a pillar candle in a holder for a lovely and cost effective centerpiece. 8. I love the idea of using small beach-theme related vases or containers and putting a few tropical blooms in each. Then arranging them down a long table or in the center of a round or rectangular table. Try using a different kind of flower in each vase. 9. Use mason jars as containers and if you start early enough you may be able to find the vintage soft blue jars that were almost made for beach wedding centerpieces. Check out thrift stores, flea markets and the like to find them. 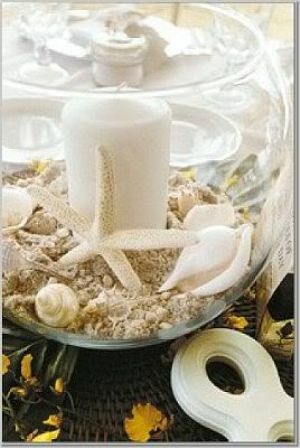 Then just use your creativity to decide what you want to fill them with as your beach table centerpieces. 10, A gorgeous fresh fruit edible centerpiece couldn't be more perfect for a beach wedding. Seasonal and tropical fruits cut and sliced in an appetizing way and arranged on a bamboo platter or beach-themed trays is both colorful and tasty. Place a whole pineapple in the center for decoration. Well there you go with beach or beach-themed wedding centerpiece ideas and hopefully you are now thinking of great ideas yourself. Make it lovely and yet it can be inexpensive if you plan and shop just right.